Tomorrow. With apologies to Annie, we’re prepared to bet our bottom dollar on it. Or, at least to think we can plan for it, and for the future more generally. 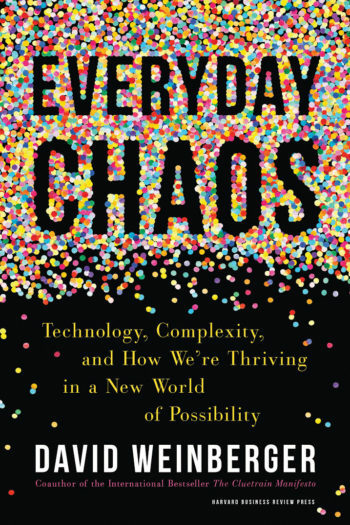 But, as David Weinberger argues convincingly in Everyday Chaos, it’s time we change the way we think about the future. Instead of planning for it, we should be unanticipating it. For centuries, we’ve imagined that we are following a path to progress that is steady and predictable. Planning, therefore, has been a matter of pruning away options until we could settle on a series of steps that would get us to the next point on that path. That has been the basis for most strategy – whether for business, in the military, or as part of personal goal setting. That approach presumes the world can be explained by causality and that we can influence the future by pulling the right levers. But that idea is being shaken now that technology is revealing that the future is far bigger, and more complex than we ever imagined. Not only is it too big and too complex to anticipate or predict, it turns out that the best strategy for getting to the future we want is to create more possibilities, rather than fewer. David Weinberger is one of our most astute and original observers of the ways in which technology is remaking the world in which we live. In Everyday Chaos, he takes us to Facebook and the New York Times, to NASA and the US government, to show how the shift in how we approach the future is already taking hold. From the impact of MOOCs (massive online open courses) on higher education to the explosion of novel systems for coping with scarce resources at libraries and in city transportation systems, he charts a transformation already in progress. It’s impossible to predict the ways in this shift is going to change our world—and that’s exactly how we should want it to be. A mind-blowing, game-changing, fun-to-read race into the future. With classic Weinberger wit and brilliant insight, this book shatters the myth of predictability while delivering grounded, actionable advice for anyone trying to thrive in the everyday chaos that has become our world. A page-turner must-read for everyone.